“It’s the first time I’ve been a distinguished anything!” says Jim Toomey, beginning his presentation as the distinguished speaker for the annual Knowlton-Jackson Lecture of the Center for Marine Biodiversity and Conservation (CMBC) at Scripps Seaside Forum Auditorium last Friday afternoon. The speaker series, which began in 2013, is named after Nancy Knowlton, founder of CMBC, and Jeremy Jackson, both marine biologists. 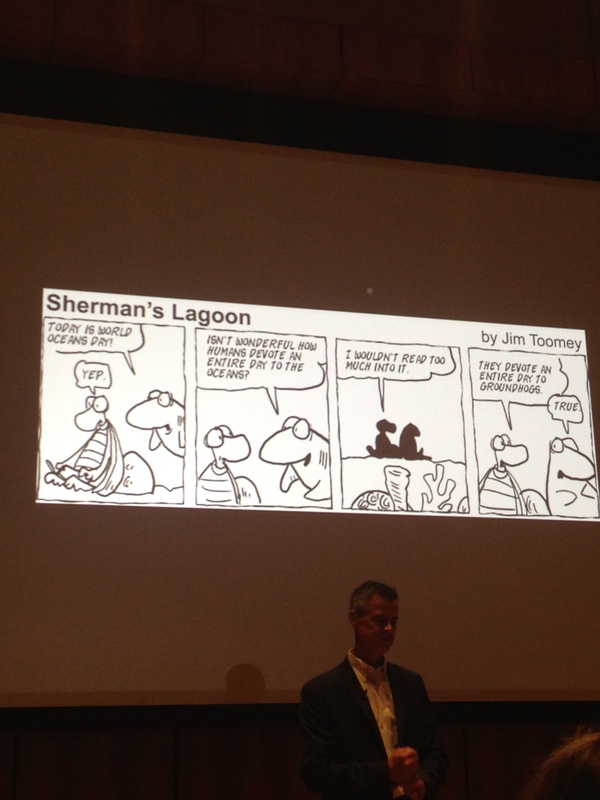 For the past 20 years, Toomey has been writing and drawing the daily comic strip, Sherman’s Lagoon, which is syndicated in over 250 newspapers in North America and in 30 foreign countries. Its cast of sea creatures includes a lazy great white shark, Sherman, his wife Megan, the sea turtle Fillmore, and the selfish hermit crab Hawthorne. Toomey holds a Masters of Arts from Stanford University, and recently, he earned a Masters of Environmental Management from Duke University. The son and grandson of engineers, Toomey said he considered going into engineering as well, but the ocean fascinated him at a young age, and he enjoyed doodling in class, sharing some of his earliest drawings of sharks. He also became aware of the “incredible powers” of ocean creatures. For example, about Sherman he said, “he’s talented without motivation—like some human characters.” He could easily catch more prey if he weren’t so lazy. Fillmore, the turtle, has an incredible ability to navigate; he also has terrible pickup lines. He named many of his characters after streets in San Francisco, where he was living at the time. With his cartoon, artistic abilities, and speaking skills, Toomey works toward communicating science and environmental issues to a wide audience. For example, he recently conveyed how ocean acidification affects sea creatures, including Sherman’s and other sharks’ ability to smell. He also drew a series of strips about the BP gulf oil spill. Toomey’s comics and illustrations appear in educational materials published by the National Oceanic and Atmospheric Administration (NOAA), and he partnered with the United Nations Environmental Program to create videos to raise awareness of the importance of oceans and the coastal environment. Last summer, Toomey dove to the depths of the Gulf of Mexico in Alvin, a Navy deep-ocean submersible vehicle. 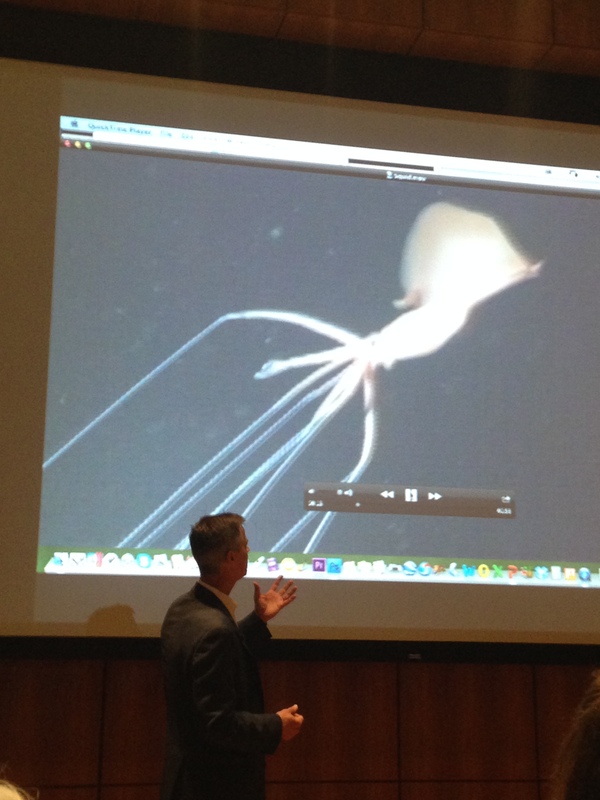 He described his experience and showed videos of the area teeming with life, including tube worms and a squid with incredibly long tentacles. The scientists aboard had technology to allow him to call his 10-year-old son’s science class in Annapolis, Maryland from the bottom of the ocean. He has plans to take his family on a boat for a year, and will describe their experiences with autobiographical comics. 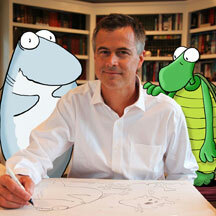 Just as he advised scientists trying to engage with the public, “if you want to reach people, you need to be honest, tell a story, and connect with your audience in a human way.” Toomey reaches and inspires many people with his entertaining cartoons and as a passionate and outspoken advocate for ocean conservation.